Q. How do I do an in-text citation in MLA style? 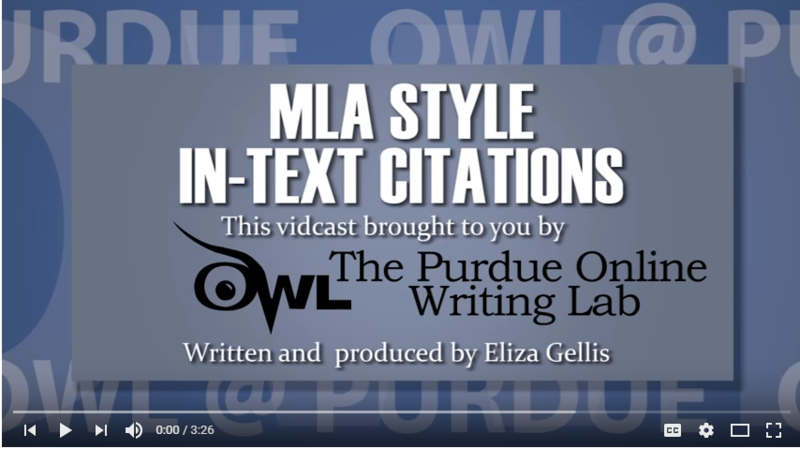 MLA in-text citations consist of the author's last name followed by the page number of the material you are quoting or paraphrasing, normally in parenthesis at the end of the sentence or quote. The "tone of words can be hurtful" (Tannen 175). Tannen has argued this point (175). "International espionage was prevalent in the 1990s in many parts of the world" ("Decade”). In the first two examples, Tannen is the author and 175 is the page number. In the third one, there is no named author so the article title is placed first in the reference on the Works Cited page. The beginning of the title (in quotation marks) is used for the in-text citation. For many websites, there won't be a page number, so you may leave it out, as long as you make the title the specific section where you got the information you are citing.